No matter what your needs, be it residential or commercial, we are at hand to help produce the highest quality of work at the best price possible. We are happy to quote obligation free, so please don’t hesitate to contact us with your plan. If you would like a quote today, fill in Our Order Form and email it to info@laminatedbenchtops.com.au. Please provide a rough drawing showing the overhead view of your new benchtop. OR use the quote form below. The more information you can provide on your plan, the more accurate the quotation we can provide. 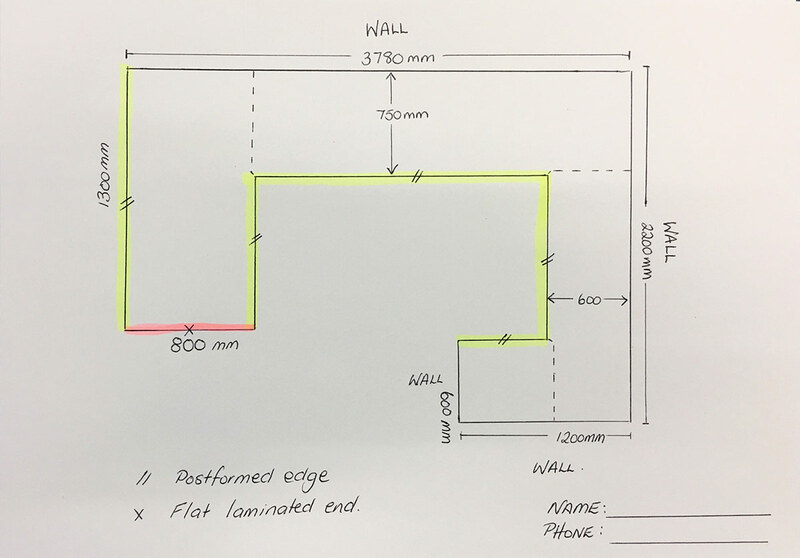 Need help, check out this example of a benchtop plan. The lengths and widths of all benchtops. Measure the length from the end of the benchtops to the corner of the wall and from corner of wall to end of benchtops, also the width of the tops. Mark what sides are postformed (rolled) and which are up against walls. Where joins are to be positioned. Any seen ends, that would need to be laminated. Type of laminate finish, gloss or natural. Profile of postformed edges. 180 degrees, 10 x 10, or square form (tight roll). We also do ABS edging and laminated square edge, all these can be discussed in more detail in our showroom. If you have a photo of the kitchen, please attach it, with your plan.